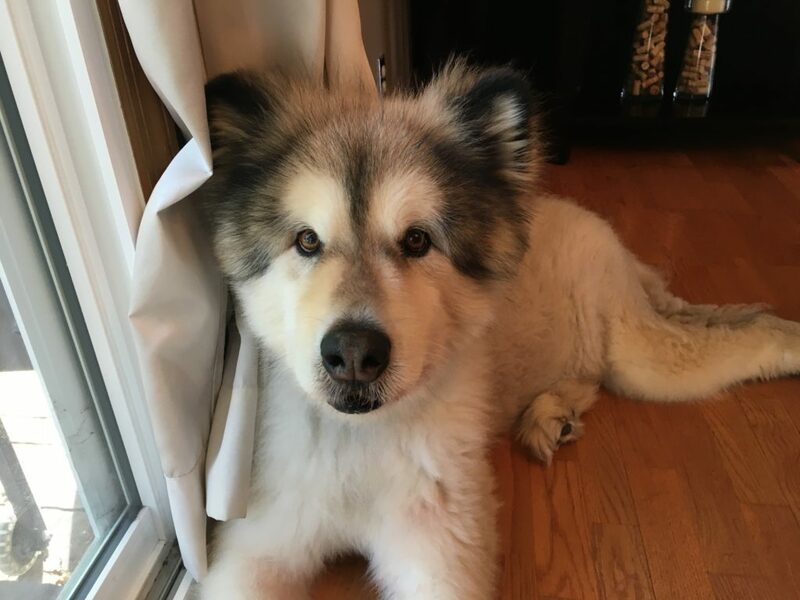 Saba is a nine-year-old Alaskan Malamute who unexpectedly got a little aggressive (barking and some Malamute-howling) when two children started play fighting at her home. This was the first time she has displayed this type of dog behavior, but her guardians set up a dog behavior training session with us to make sure it didn’t happen again. Saba did a little bit of howling when I arrived for the session; this is pretty normal behavior for Malamutes who tend to be pretty vocal. I was quite smitten with how cute Saba looked. What a beautiful dog. She had a really nice energy and her fluffy hair made her pretty darn cute. I sat down with her guardians to discuss the situation and learned that because she was so well behaved, she really didn’t have any rules. While this is fine for many dogs, a lack of rules can give some dogs the impression that they are in a leadership position or have the same authority as the humans. I’m guessing that this lack of rules and structure confused Saba into thinking that she was responsible for making sure all houseguests stayed out of trouble. I suggested a number of rules and boundaries that her guardians can introduce to help Saba start to feel more like a follower. Once the dog identifies as being in the follower position, she will learn to leave monitoring and correcting guest to her humans or stand down when they disagree with her. This is a really passive form of obedience training. As we were going over the rules with Saba’s guardians, I noticed that any time she got near either one of them, they instinctively reached over and started to pet her. I also saw that whenever they stopped petting her, she would paw at them to communicate that she did not want them to stop. This is another indicator that tells me that the dog feels that it has the same authority as the humans she lives with. I suggested that the guardians start to practice my Petting with a purpose strategy. By consistently asking the dog to do something in order to earn her praise and reward, Saba will start to see her guardians as having more authority than she does. Next I went over some nonverbal communication cues that will help the humans more effectively communicate what they do and do not want from their dog. In the process of going over these communication cues, I got up and walked briskly around the room. This sudden movement provoked the same response Saba displayed when the children were wrestling. I pulled out my camera and had one of the guardians film me as I re-created the scenario so that the other guardian could use these new nonverbal communication cues to disagree with the behavior. Saba responded very well to the new technique and communication cues. I suggested that the guardians re-create the situation with visiting children so that they can practice this new technique themselves when they are ready and expecting it. Often times, dogs exhibit behaviors at times when we are not ready and this causes us to get flustered. But if we recreate it and practice when we are ready, our timing and technique are much better. By adjusting Saba’s leader follower dynamic and practicing disagreeing in this fashion, her guardians will help Saba learn to adopt a new behavior. One activity that is usually reserved for the authority figure in a dog pack is security. Because Saba was sometimes a little reactive when people came to the door, I wanted to demonstrate a technique that the guardians can use to claim the area and move the dog away before opening it. I had one of the guardians head outside to play the part of an arriving cast so that we could practice. I’ve run through this exercise literally hundreds of times and Saba decided to do something that no other dog ever has. It’s always good when we can laugh and this was a situation that had me cracking up pretty good. This also underscores how intelligent Saba is. We reset the exercise a couple of minutes later it and made sure to put the treats in a place that Saba could not reach. This time Saba rushed over to and attempted to handle security at the door which gave me a great opportunity to demonstrate the technique. I wanted to walk the guardian through this exercise her self so we repeated it one last time. It will be important for the guardians to step directly at Saba and not stop until she has passed the boundary that they want her to respect when guests arrive. When moving backwards, they need to move in a deliberate fashion and pause briefly between each step (with their feet squared together) to make sure that Saba stays in place. Based on how quickly she responded, I’m guessing it won’t take more than a half-dozen practice repetitions before Saba starts to wait behind the boundary whenever there is a knock at the door.